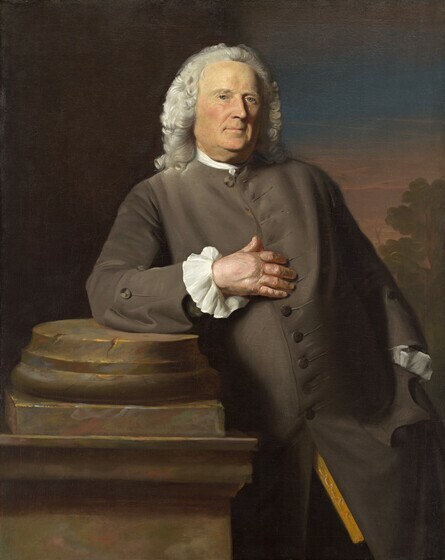 John Singleton Copley, the foremost artist in colonial America, was virtually self-taught as a portraitist. By meticulously recording details, he created powerful characterizations of his Boston sitters. After he emigrated to London in 1774, Copley began to specialize in narrative scenes from history and joined the influential artistic institution, the Royal Academy of Art. Copley demonstrated a genius, in both his American and British periods, for rendering surface textures and capturing emotional immediacy. 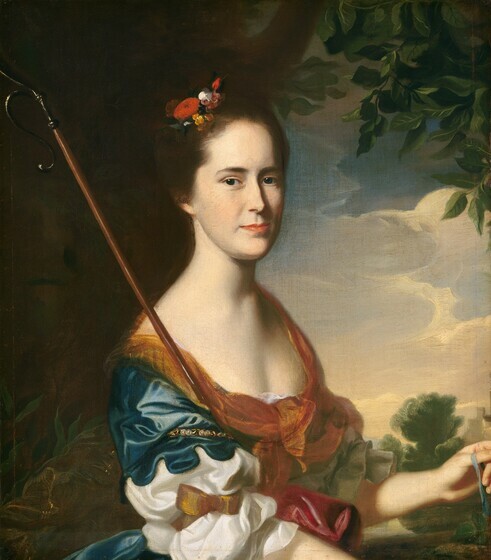 The eighteen-year-old Copley proudly signed and dated this picture “1756.” His sitter, Jane Browne (1734-1802), daughter of an Anglican minister from Portsmouth, New Hampshire, later married a judge, Samuel Livermore. The painted oval border and the subject’s elegant pose derive from engravings of English portraits. The awkward anatomy, however, indicates that Copley lacked formal training. Still, the young artist did carefully distinguish the textures of taffeta, lace, and beads. Copley's art matured quickly, as evidenced in this forthright portrayal of Epes Sargent (1690-1762). As proprietor of almost half the land in Gloucester, Massachusetts, the sitter confidently sticks one hand in a pocket and leans on a sturdy column base that forms a traditional emblem of Fortitude. Copley candidly noted such factual details as the mole under Sargent’s left eye and the powder fallen onto his shoulder from his wig. 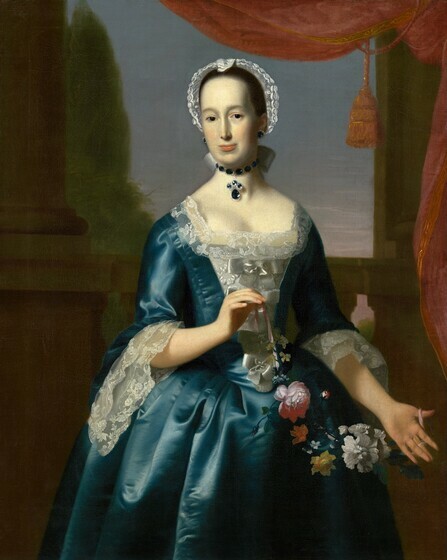 The deep blue of the sitter’s silk dress befited the restrained tastes of colonial America; British women preferred brighter colors. Anne Fairchild (1730-1803) wed the owner of a country estate in Portsmouth, Rhode Island. The floral garland in Mrs. Bowler’s hands, besides being a standard symbol of beauty, may refer to her husband’s wealth; he possessed one of the very few greenhouses in the colonies. In a fanciful guise taken from European prototypes, the sitter appears as a shepherdess holding a herder’s staff. 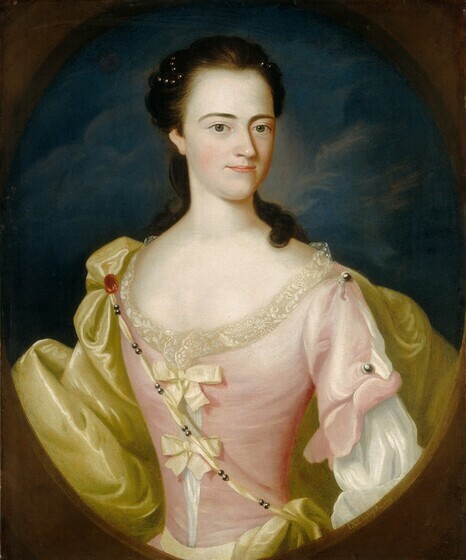 Elizabeth Gray (1746-1779) married a Boston merchant in 1764. With its promising sunrise, this pastoral scene was almost certainly commissioned to mark her wedding. 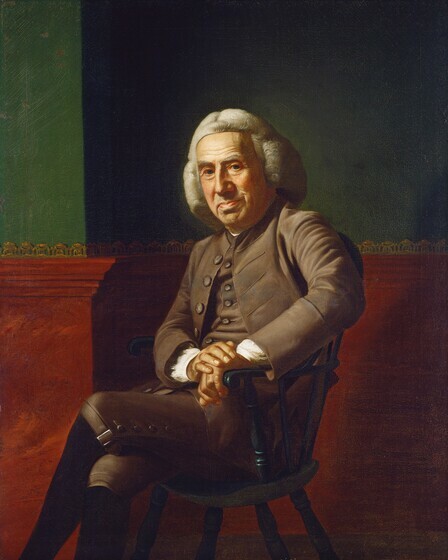 Copley excelled at portraying elderly men, as with this penetrating likeness of an eighty-two-year-old legislator and former frontier soldier from Tyngsborough, Massachusetts. Eleazer Tyng (1690-1782), sitting comfortably in a Windsor armchair, turns to greet the viewer. His appraising face and rugged hands are highlighted by a golden glow. 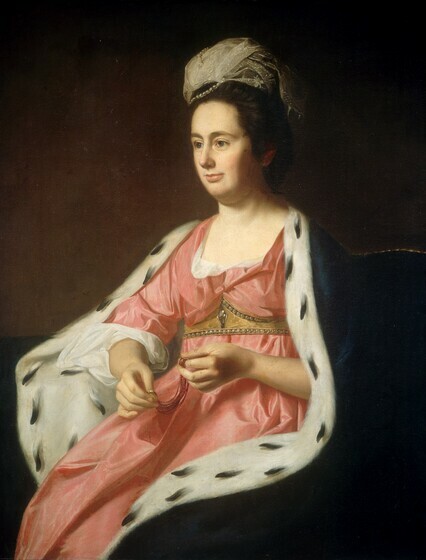 The subject, Abigail Smith (1744-1777), was the wife of a wealthy New Haven, Connecticut, shipowner. Mrs. Babcock appears regal in her ermine-lined cape and pearl-studded girdle. Her portrait is possibly Copley’s last American work, finished just before he left for Europe, never to return. 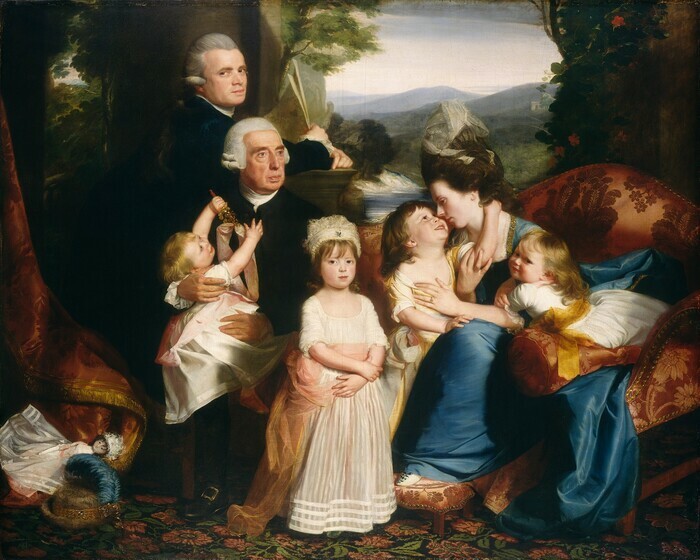 Having moved to England, the Copleys posed for this huge group likeness, which was the artist’s first portrait to include more than two sitters. The thirty-seven-year-old painter holds sketches and looks out as though to introduce his family. While three daughters look on, Copley’s wife, Susanna, hugs their son. (In eighteenth-century custom, toddlers wore long dresses regardless of their gender.) The aged Richard Clarke, Copley’s father-in-law, was a Tory merchant whose investments had been thrown overboard at the Boston Tea Party. The imaginary setting acts as a dual allegory of the Copleys’ civilized sophistication, represented by the elegant furnishings, and their natural simplicity, recalled by the Arcadian landscape. 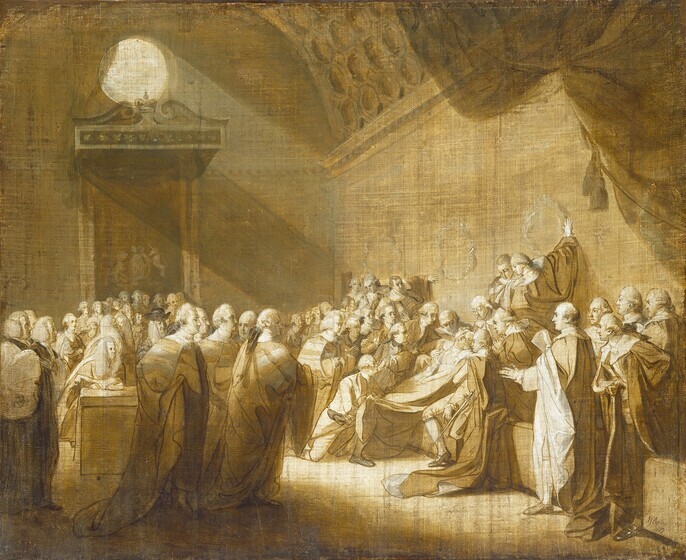 Exhibited at the Royal Academy in 1777, the ambitious picture demonstrated Copley’s recent studies on the Continent, where he had learned to integrate a large number of figures into a coherent design. For example, he placed the babies high up on a sofa and in a lap so that their tiny heads would be on a level with their standing siblings. This gripping pictorial drama resulted from a collaboration between Copley and Brook Watson, a former English sailor. When Watson was fourteen in 1749, he had been attacked by a shark while swimming in the harbor at Havana, Cuba. The blood in the water proves that Watson already has lost his right foot. Rushing to his aid, his shipmates register many different reactions, ranging from heroism to horror. Watson fails to catch a rope hurled by a West Indian. Meanwhile, boathook poised, a harpooner takes aim at the man-eating monster. Copley grouped the rescuers into a dynamic composition that forms the silhouette of a sharply thrusting triangle. 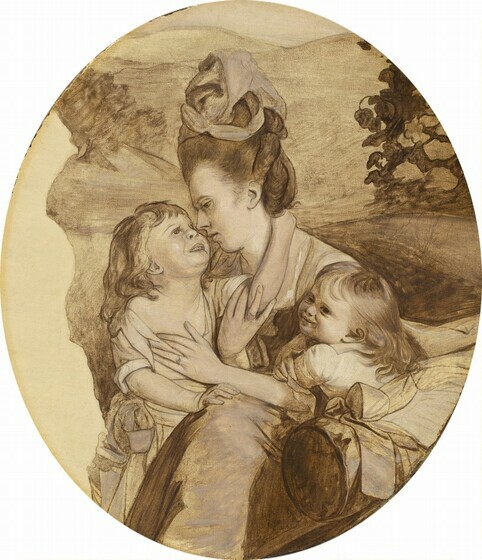 Brook Watson bequeathed the painting to a London orphanage, where it conveyed the reassuring moral that anyone can succeed through “activity and exertion”—as stated by the biographical plaque on the original frame. In spite of being orphaned himself and also disabled, Watson had earned ennoblement as a baronet. The depiction of a noteworthy event in an ordinary person’s life was an American innovation. European painters normally restricted such harrowing scenes to saints' martyrdoms. 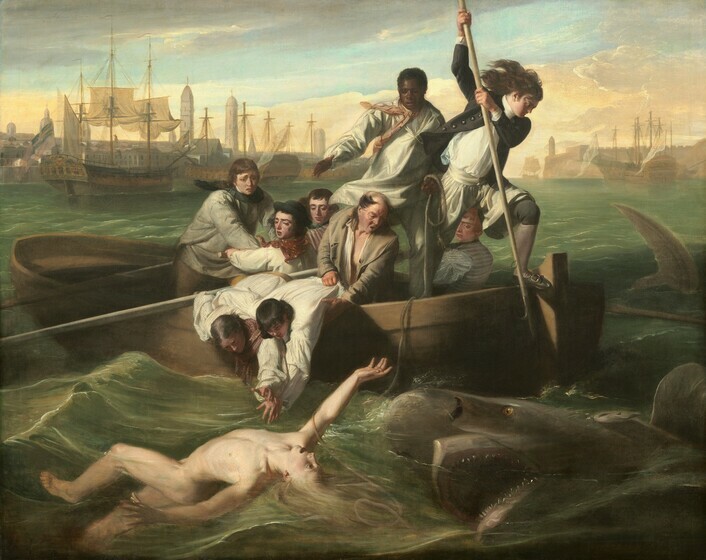 This unusual canvas caused a sensation that assured Copley’s international reputation after its exhibition at the Royal Academy in 1778. A full-scale replica that the artist painted for himself is in Boston’s Museum of Fine Arts. On 7 April 1778, William Pitt, the first earl of Chatham, rose to speak in the House of Lords. In the midst of debate about the colonial revolutionaries, he suffered a stroke. The earl’s death removed one of Britain’s leading political moderates during the critical years of the American War of Independence. This small oil painting is Copley’s preliminary compositional sketch for a large canvas now in the Tate Gallery, London. In proper academic procedure, Copley first used browns and grays to work out the overall distribution of the scene before considering the color scheme and details. Sunshine pours in from a roundel window over the throne canopy, spotlighting the stricken Pitt. The pencil lines drawn over this study create a proportional grid called “squaring” that enabled the artist to transfer and enlarge the design. In 1781, after two years’ work, Copley installed his ten-foot-wide picture in a pavilion and charged admission to his popular one-work show. How Copley had persuaded fifty-five noblemen to sit for their portraits became the talk of British society. The models were the artist’s own handsome children, now seventeen years older than when they posed for The Copley Family. John, the boy hugging his mother in that painting, is the Red Cross Knight. Elizabeth, the daughter standing in the center of the family portrait, is Faith, and Mary, the infant on the sofa, is Hope. 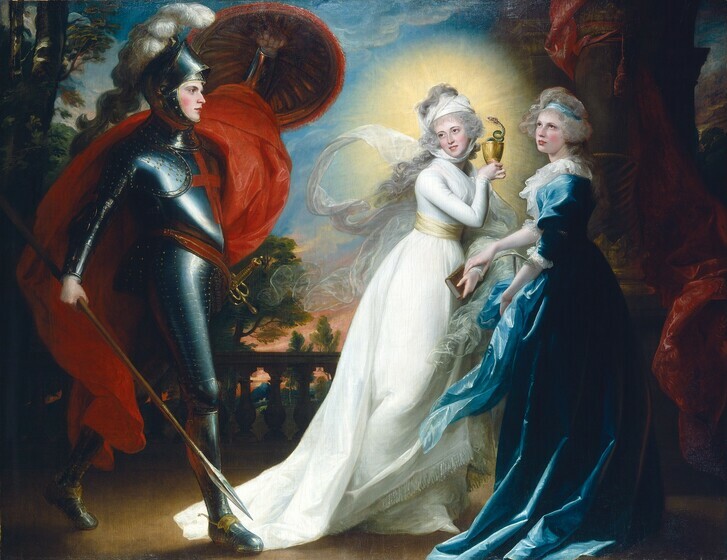 The Red Cross Knight, Copley’s only painting inspired by literature, was shown at the Royal Academy in 1793. The red-coated William Fitch (1756-1795), an American-born officer in the British army, prepares to depart on a magnificent steed. 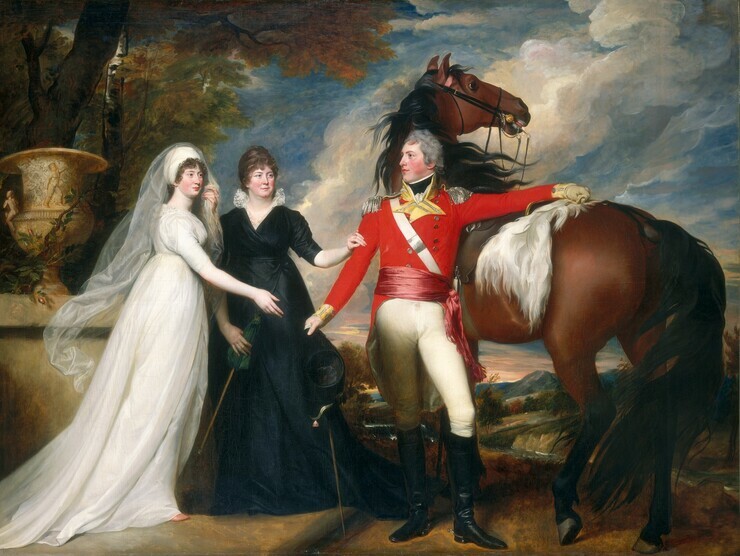 Since Colonel Fitch had been killed in action at Jamaica six years before this gigantic group portrait was exhibited at the Royal Academy in 1801, Copley must have painted his late friend’s image from memory or from other likenesses. Fitch’s two sisters, dressed in mourning, reach poignantly toward their lost brother. The antique urn is a funerary emblem, and the fiery sunset is a reminder of time’s passage. 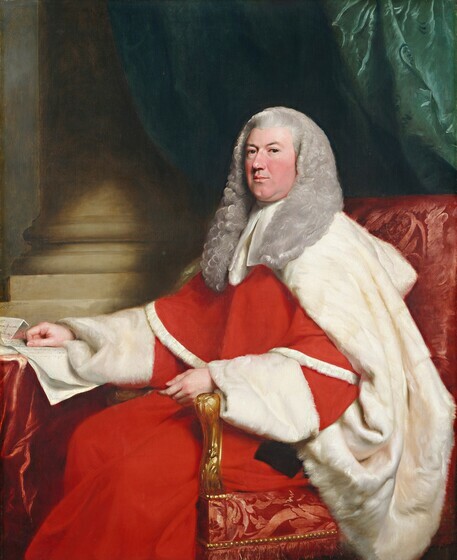 Robert Graham (1744-1836), knighted in 1800, wears the vermilion robes of the House of Lords. The portrait, shown at the Royal Academy in 1804, achieves grandeur by contrasting the brilliant red cape with white ermine and green drapery. In the candid depiction of the baron’s fleshy face and double chin, however, Copley continued his forthright Colonial style.